These two printable miniature boxes are designed to hold small presents or make a set for an advent calendar. Each box measures roughly 2 x 2 inches by 1 1/2 inches. Two boxes can be printed on a standard sheet of lightweight card or photo paper. Photo ©2008 Lesley Shepherd, Licensed to About.com Inc. These free printable boxes can be made in sets for an advent calendar, or used to wrap small gifts. Made of lightweight card or photo paper, they offer protection for items sold at miniature or craft sales, or a way to make a tiny present special. Each box measures about 2 inches by 2 inches by 1 1/2 inches in size. Packaging small items for Christmas shows can be expensive, especially for people just starting out. Having a few of these boxes on hand may help buyers view your items as making a great gift. Boxes also serve as a place to add a stamped business name or web address. To use these little boxes for an advent calendar, print out a set for as many days as you wish the calendar to count down, and write or stick a number on each box (near the door or on the roof of the gingerbread house, or in the center of the wreath). 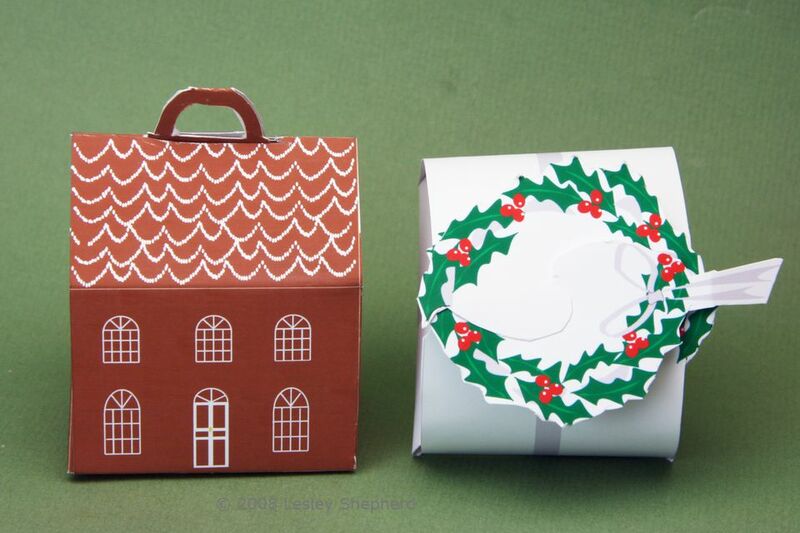 This layout fits two printable miniature gingerbread boxes on a single sheet of 8.5 x 11 inch paper, lightweight card, or photo paper. Photo ©2008 Lesley Shepherd, Licensed to About.com Inc.
Standard Letter Sized Sheet of paper, photo paper, or lightweight card. Each sheet will make two boxes, roughly 2 x 2 by 1 1/2 inches in size. PVA (White Glue) or a glue stick. Print out the Pdf (Acrobat Reader) file of the gingerbread boxes Each letter size page will print out two boxes. Cut out the box along the outside lines, cutting the roof sections free from the roof support tabs. Fold all the walls along the light lines, fold all the tabs along the light lines. Fold the roof with handles down along the roof line, and fold the double roof in half along the fold line. Cut out the slot opening on the double roof line when you have the roof folded in half. Use your craft knife to cut a slit where marked in white, just below the roof line attached to the box handle. Cut out the centers of the box handles. Run a bit of glue along the tab on the side of the box, and press it against the box back. Set aside to dry. When the box sides are glued together, apply glue to the short tabs on the base of the box and press the long tabs in place over them. Set aside to dry. When the box base and sides are dry, fold the handle in half, and fold the single roof pieces over the roof support tabs. Insert the handle through the center of the double roof piece and take the roof tab back into the slot you cut on the lower roof. Tape the slot in place if necessary to hold the roof closed. This is certainly necessary if you intend to hang the box by its handle. These free, printable miniature boxes with a holly wreath on top, are self closing and can be printed two to a standard page of paper, photo paper or lightweight card. Photo ©2008 Lesley Shepherd, Licensed to About.com Inc.
Clear Packaging Tape small amount to seal box securely. Print out the Pdf (Acrobat Reader) file of the Holly Wreath boxes Each letter size page will print out two boxes. Cut out the box along the outside lines, cutting the wreath leaves and bow out roughly. Cut along the narrow curved silver line that leads to the center of the wreath, cutting carefully close to the wreath details as you do so. Use your craft knife to cut a slit where marked in silver, on the short box side with no tab. With your contents wrapped gently in tissue paper, fold the two short sides of the box over the contents, and insert the tab down through the slot. Tape the slot in place. Take the two ends printed with holly and pass the tab end with the bow, under the plain holly tab, joining them together to make a circle. If necessary you can use a small amount of tape to hold the tabs in place.